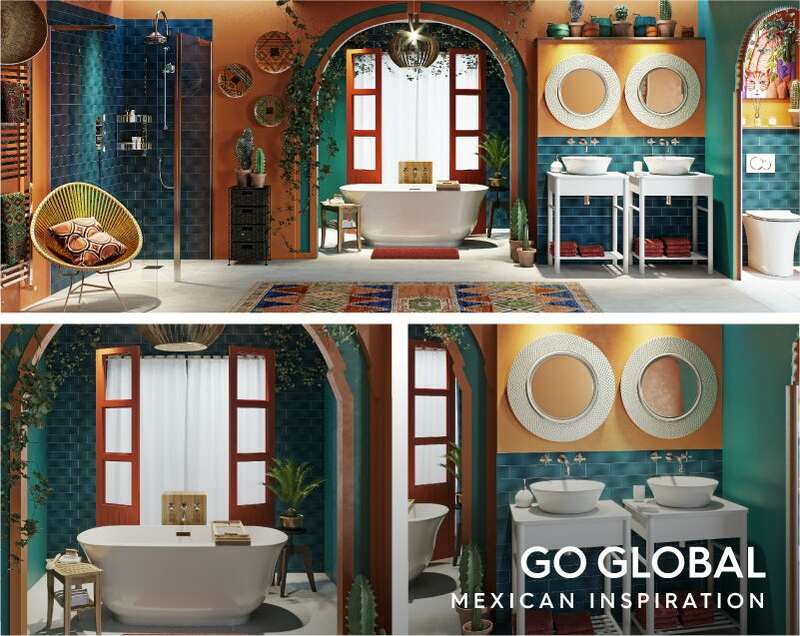 Take your interiors on a journey of discovery… In my latest style guide, I’ll show you how to create a fiesta for the eyes with a Mexican-inspired bathroom. 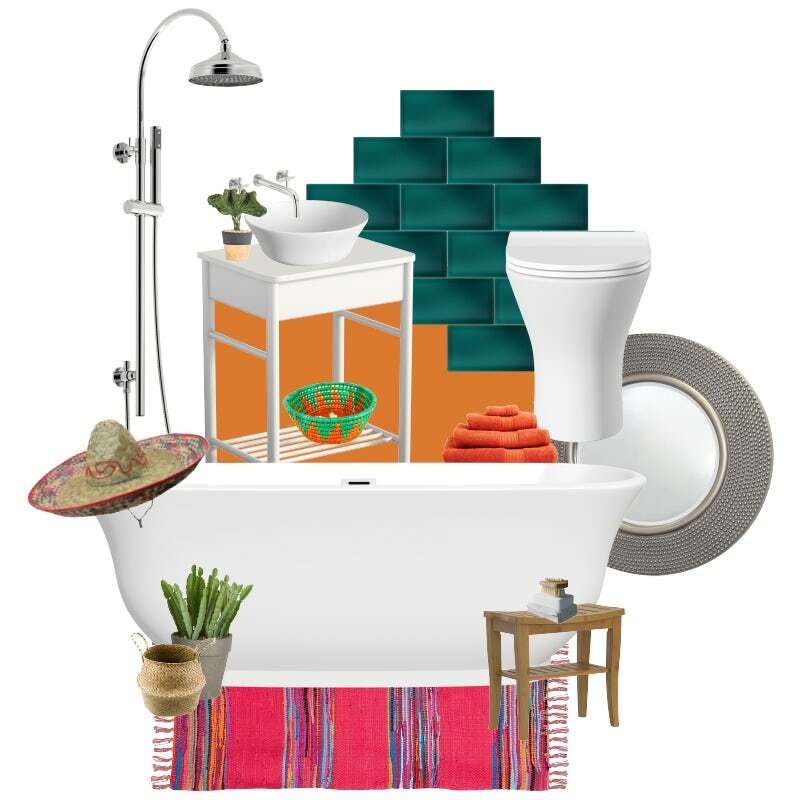 Moving on from our recent Indian-themed bathroom and Middle East-themed bathroom, this week, we’re heading south of the border, for some hot and spicy bathroom inspiration. If you’ve ever travelled to Mexico, you’ll understand why interiors tend to be bright and cheerful—after all, Mexicans need little excuse to throw a good party! Mexican design is greatly influenced by its Spanish colonial settlers but also by Native American culture, creating a fascinating blend of styles. The beautiful colours and patterns lend themselves perfectly to bathrooms big and small. 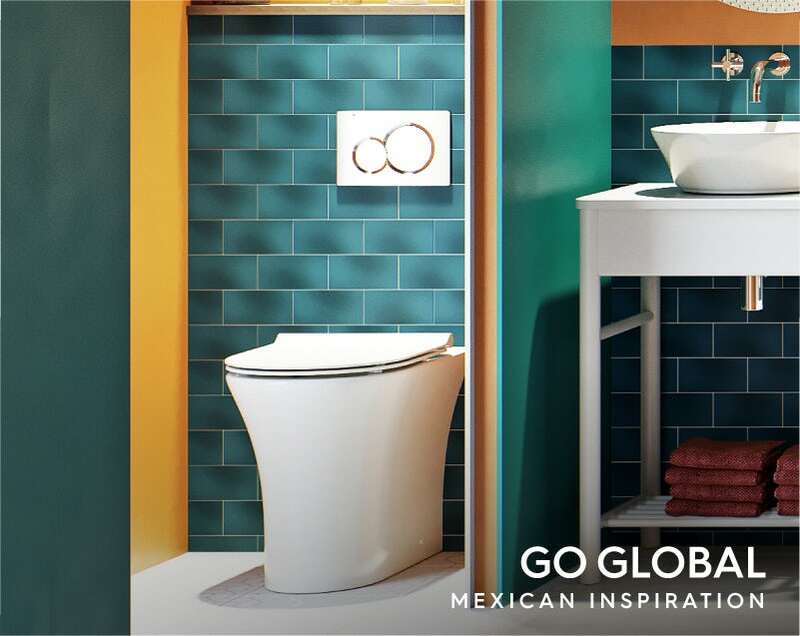 Combining old world charm and artisan craftsmanship with a contemporary outlook, my Mexican-themed bathroom is a riot of vivid colour, mixed with exotic patterns and bursts of greenery. Whilst colour is the first thing to hit you square in the eyes, I've attempted to incorporate some more subtle elements into this bathroom design with arched shapes around the alcove and toilet area. This can be achieved by fitting your own false walls. An experienced joiner should be able to help you with this. I’ve opted for walls in a warm shade of ochre, reminding me of the desert areas found in the northern states of Sonora and Chihuahua. These have been painted to give a pleasing stucco effect (a type of textured plaster). Meanwhile, the blue tiles reflect the extensive coastal regions, shimmering like the sea. For contrast, [grey tiles] with a stone effect have been used on the floor. Adding further bold colours into the mix could get a little too much, so I’ve kept with white for the washstands and basins, mirrors, toilet and bath. If you’ve picked up any Mexican keepsakes on your travels, now’s the time to loudly and proudly show them off on your walls and surfaces. We’ve added cacti and trailing plants which are suitable for bathrooms to add a touch of greenery to the look, plus that all-important traditional hat. To help inspire you further, why not create a Mexican mood board, like this? 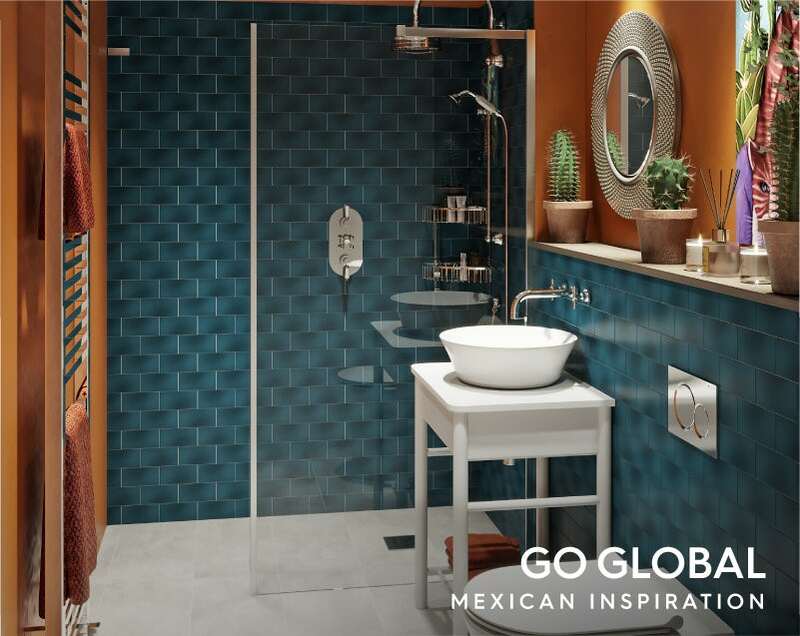 Let’s take a closer look at each different area within our Mexican-inspired bathroom. As I’ve already mentioned, Mexican interiors tend to blend old and new together. To keep up with the latest trends, we’ve created a super-accessible wet room shower enclosure with glass panels and peacock blue tiles. With a nod to the old, we’ve included a traditional style mixer shower. 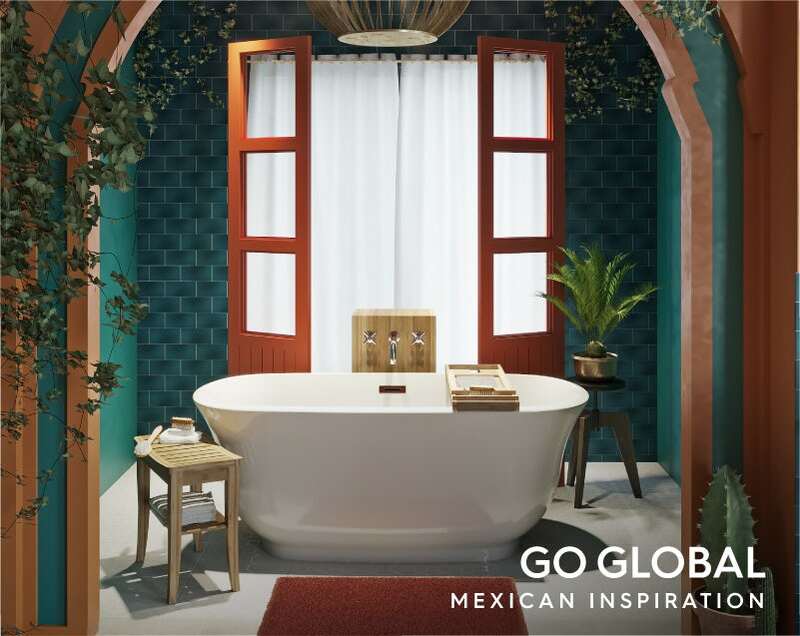 The traditional style bath fits seamlessly with our Mexican theme, blending the old and new world together. The pristine white finish provides contrast against the colourful backdrop. We carried the blue tiled theme around to the basin area, where we added twin white washstands with countertop basins. Large, circular mirrors are accompanied by some cactus plants and baskets, however, you could display anything you’ve collected on your travels in this space. A decorative archway leads to the separate toilet space, where we’ve added a false wall halfway up the original wall. This houses a concealed cistern, so we can add a contemporary back to wall toilet and flush plate. Giving a small space some south of the border style really isn’t too difficult. This beautiful, colourful décor lends itself well to a small bathroom or ensuite. We’ve kept the warm ochre and vivid peacock blue tiles, turning the room into a walk in wet room. 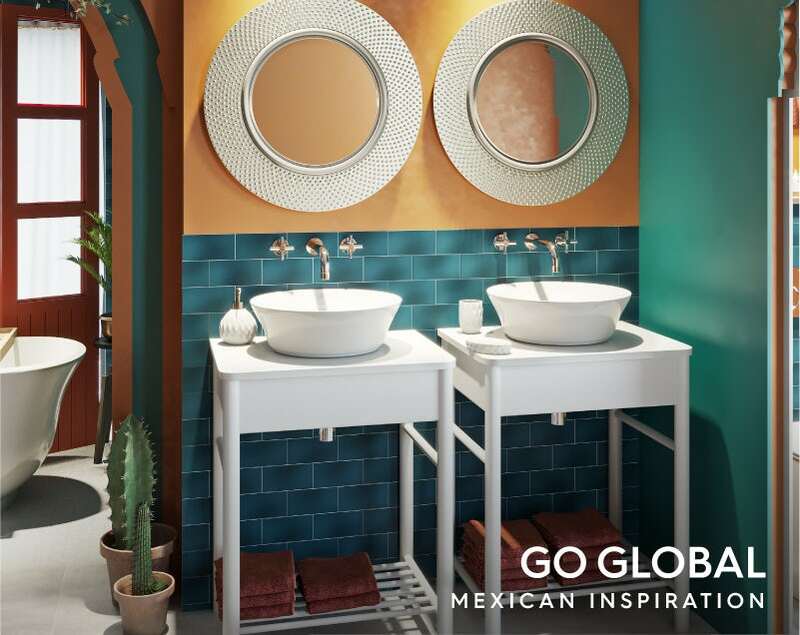 The pale washstand, toilet and flooring give contrast to the vibrant colours, whilst a false wall halfway up the right hand wall provides space to show off your Mexican collectables, prints and plants. Discover more great ideas and advice for small bathroom spaces. If you’ve enjoyed our Mexican-themed design, you’ll be happy to hear that our travels aren’t over quite yet. 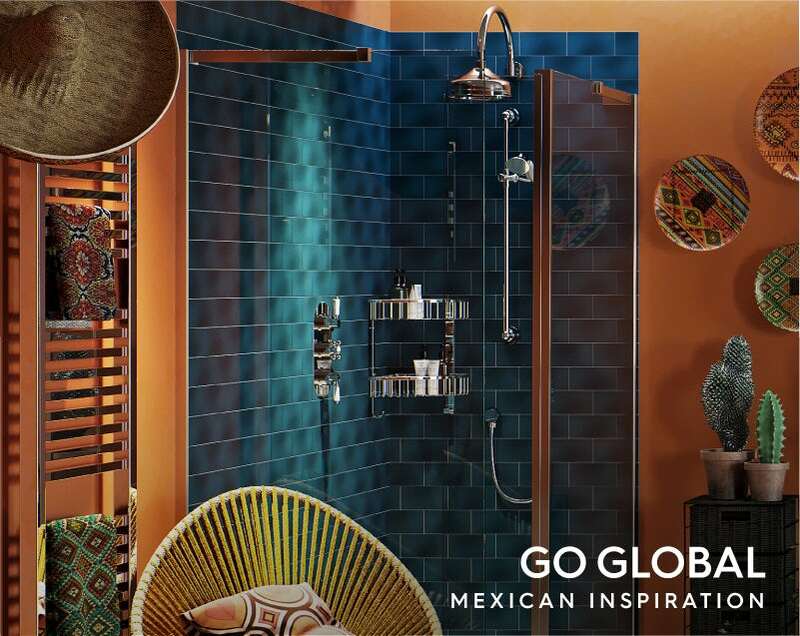 Click on the images below to discover more "Go Global" bathroom designs. Go on… be adventurous.